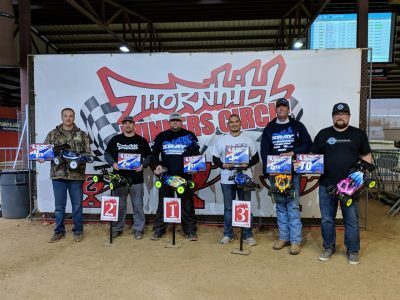 RCPRO Finals this weekend, came to Thornhill Racing Circuit, and the weather would be a big factor in the races, with a fluctuation of about 30 degrees, would affect engines and tire choices. During Friday practice, I tried a few different tires, and compounds, and settled on something I thought would be good setup and tire wise in both cars. Pro-Line Slidelock M3 would be my tire choice for the next day. The races are run in qual points style, and only having 3 rounds of qualifying, consistency is key. in the first qualifier, and colder conditions in ebuggy, i snapped a left front lower arm during warm-up, and didn’t get to run that race. in the nitro qualifier, i was able to run the full race, until the last lap where for some reason the right rear drive axle came out of the diff cup. Now i needed 2 good runs in both the next heats to make it to the A main. In heat 2 for both cars, Pro-Line Slidelock M3 would be the tire i would stick with, although i wanted to try the Pro-Line Invader M3. in ebuggy i would finish 3rd that round, nitro buggy i would finish 4th for the round. in Round 3, ebuggy, i would have a good clean run, on TQ pace with the Pro-Line Invader M3 where i would get hit from the side by a lapped car missing the corner, and one mistake on the back straight where i would traction roll, and the marshal was away from his spot, dropping me to 6th for the round, making me 6th overall. Nitro buggy, stuck with Pro-Line Invader M3 and i put in my best run of the day, but still only good enough for 4th overall, giving me 4th on the grid. Main day i had plenty of time to go through the cars, and get them prepped, and watch what others were doing tire wise. E-Buggy A1, was a very tight race with the top 6 all close on speed and time, in qualifying and the race would prove it as well. mistakes would be costly. good start, got up to 4th from 6th on the grid. I decided with the temperature being colder, Pro-Line Slidelock M3 would be the tire to stick with. I battled with Xray/RCA teammate Nick Vanderpool, as we pressured Hagen in 2nd. 2nd through 5th nose to tail train of cars. Nick and Hagen would tangle, and i tried to make a pass, but Hagen blocked me, and i hit the pipe, and flipped back to 6th place. pushing hard, the leader would have battery issues, i made a last lap move on Xray/RCA teammate Nick, and moved into 4th. then last corner 2nd and 3rd crashed, and i moved into finish 2nd. 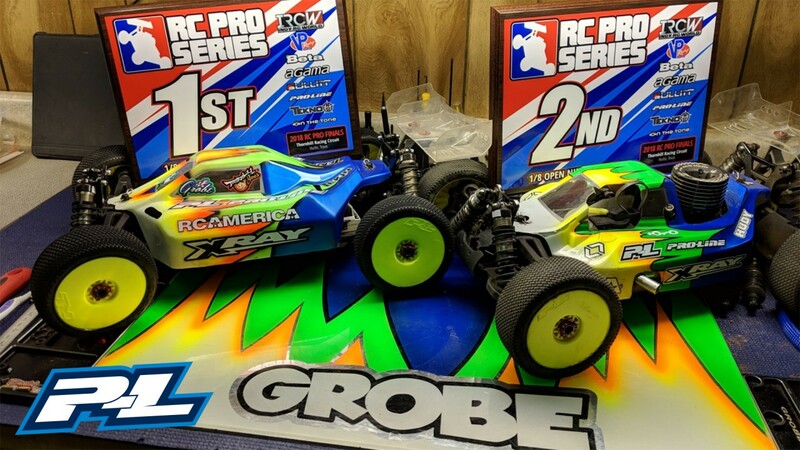 Ebuggy A2, another good start, and another good race. 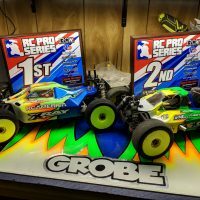 I stuck with Pro-Line Slidelock M3 for this race as well. i was able to move up to 4th again, and a car train ensued for most of the races, again leader another electrical issue dropped him out, and its a 4 way battle for the win. a wreck from the new leader moved me to 2nd. clean racing would then go until the last 2 laps where the leader crashed, and i took the win. Giving me the overall in ebuggy. Starting 4th on the grid for the 30-min Main. I had chose to go with Pro-Line Invader M3 but i made a last minute tire change to Pro-Line Slidelock M3, which would be a good choice. i tried to settle into rhythm, got out to 2nd on the start, followed for a while, till a crash dropped me to 3rd. 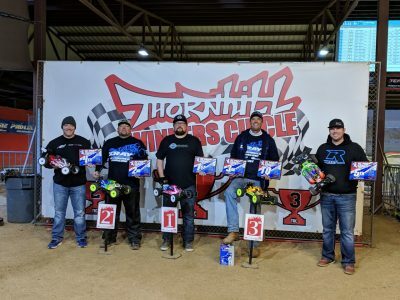 after the first pit stop i came out in 2nd again with a fast stop from my crew using my Pro-Line Fuel Stick, where i would battle for 3rd for some time. drop to 3rd right before the pit stops, and pitting one lap later than 2nd, after my stop, again very quick, i came out in 2nd again, this time with about 4 second gap over 3rd. i would finish 2nd in the race, 20 seconds out of the lead.